Project obstacles and solutions: The Avant Apartments are a mixed use multi-family and retail development that are part of The District in Carmel, Indiana. Apartment specialist, Edward Rose, is developing The District to include 400 apartments, 65 single-family town homes, a senior-living facility and a 100 room hotel on 30 acres. At the center of the development is a four-level, stand-alone parking garage surrounded by luxury apartments. Lithko poured all of the concrete for this project. The project called for various concrete mixes to meet engineering specifications. IMI QC/QA worked with the site engineer and contractors to test each mix design and make sure the delivered product was meeting specs. 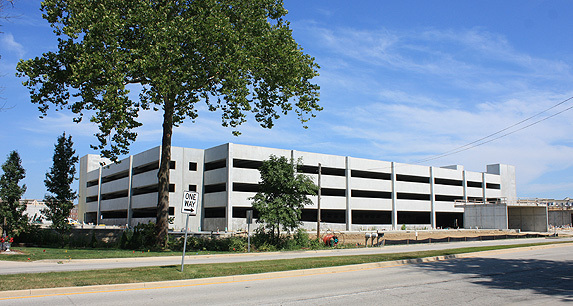 The parking garage was built with precast concrete and then finished with 800 yards of topping mix. This mix used a high-range water reducer to increase strength without compromising the workability of the concrete. The apartment floors surrounding the garage were built with slab-on-grade concrete with micro-synthetic polypropylene fibers in the mix to control cracking. The corners of the structure were designed with towers that housed elevator shafts and served as the entry and exits to the building. These were built with poured columns and post-tensioned podiums. The concrete for the tower podiums were poured 10-12 inches thick and were mixed to meet 5,000 psi. These were specified to meet an early strength of 3,000 psi in 24 hours so the post-tensioned tendons could be stretched. IMI QC/QA used a maturity curve to determine the strength of these thick slabs. Since they were poured in the heat of the summer and were so thick, they met early strength faster than the specification required. This allowed the tendons to be pulled early. In total, IMI supplied 2,600 yards of concrete for this project. All of it met specifications and no trucks were rejected on the site. For more information on concrete specifications, contact the sales representative for the concrete plant nearest your location. Click here.